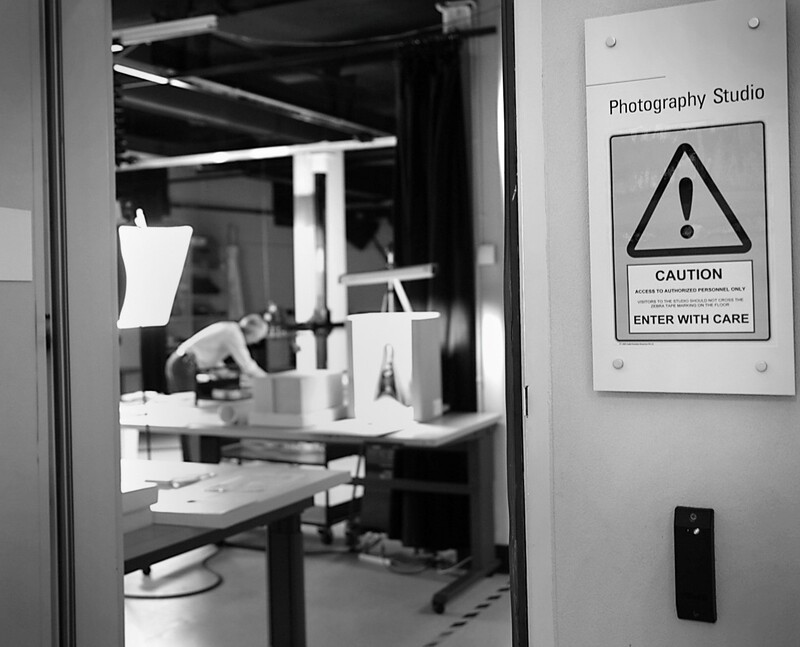 The Library’s imaging studio is home to two full-time photographers and a studio supervisor. We handle the high end digitisation of a variety of collection items for public orders, digitising projects and other library requests. A day in the studio is never dull. 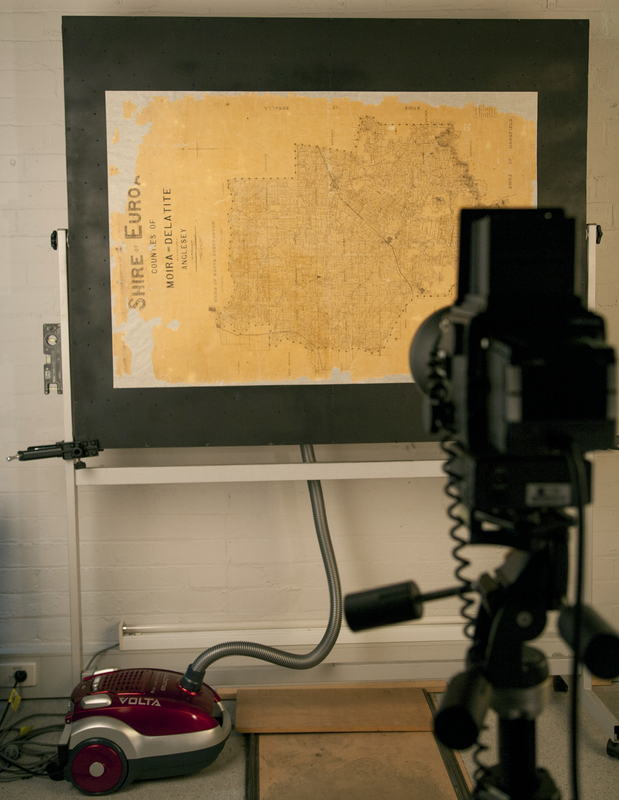 9am: I start the day with a public request for a copy of a large map of the Shire of Euroa from 1884. It is too large to fit on our standard copy tables, so I use the vacuum board to shoot it. Using this device means I can shoot large material without having to climb up and down a ladder. The vacuum board uses a real household vacuum to create a light suction that runs through channels built into the board. Small holes in the surface of the board use the suction to gently hold the material onto the board. 11am: Conservation staff have delivered items that will be going on loan in a few months. They need some printed photographs of the items for condition reporting. Condition reports are used to record any damage to items before being loaned. The items can be checked against their condition reports when they return to see if their condition has changed. 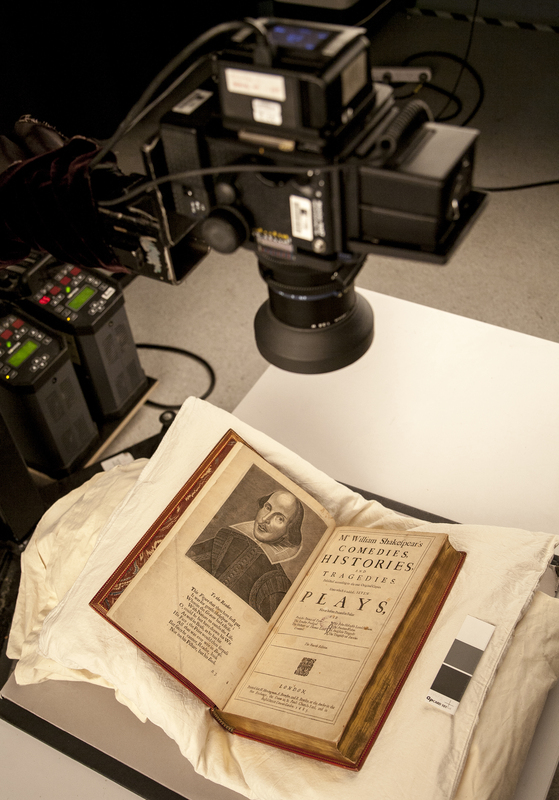 This 4th folio of Shakespeare from 1685 will require multiple shots to capture all angles of the book for its condition report. The light table set up with a view of the cover and spine of Mr. William Shakespear’s comedies, histories, and tragedies from 1685. It will soon be going out on loan. The shots taken will include each page that will be displayed during the loan institution’s exhibition, such as the title page shown below. 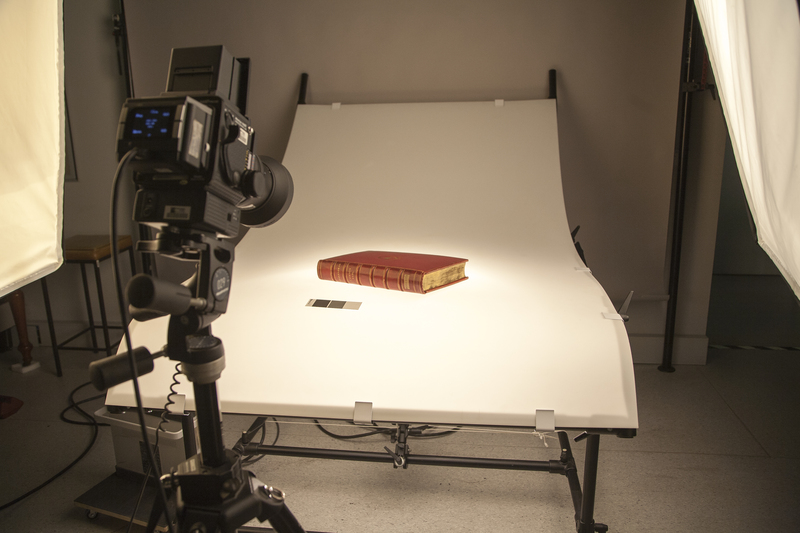 2pm: There’s time in the afternoon to work on one of the many digitising projects going on in the imaging studio. I’m working through 16 boxes of more than 1,100 stereograph images. Stereographs are the 19th century version of 3D. Two slightly different images are taken with a twin lens camera, printed and mounted together on a piece of card. The resulting stereograph can be viewed with a special device called a stereoscope, that allows the viewer to produce a 3D effect. 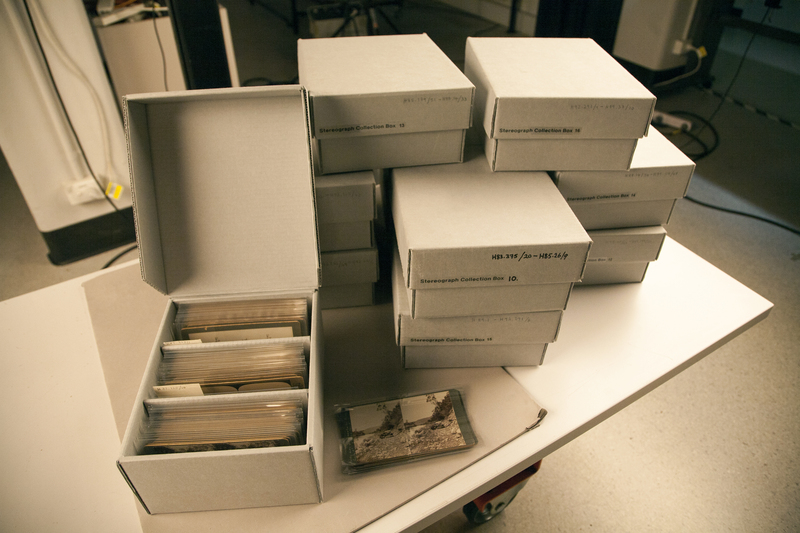 11 of the 16 boxes of stereographs to be digitised. 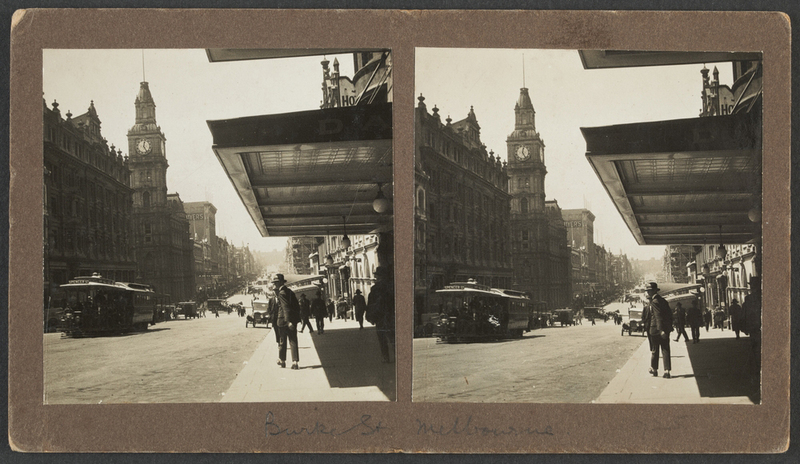 These stereographs will all be available to download once the project is complete, like this one of Bourke Street in Melbourne from the 1920s. 5pm: It’s camera off and lights out in the studio. 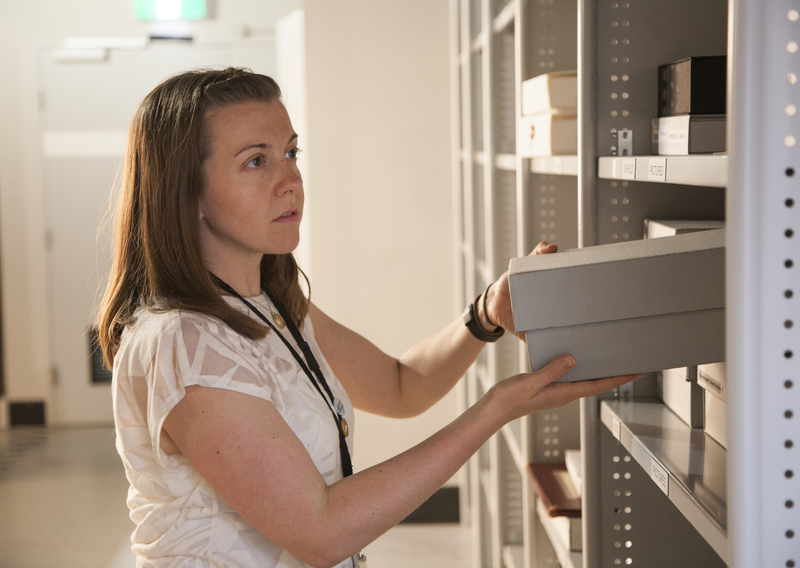 The digitised collection material is returned to the shelves to be returned to the collection stores. The rest waits for my return tomorrow. These shelves keep material organised by collection as well as by work to do and work completed. Sarah is a former Imaging Studio Photographer at the State Library. Thank you for sharing; very interesting indeed. Is it possible to order photos of melbourne streets between the 1890s and 1918, or is a book available. I really enjoyed this article so thanks for sharing, I’d love to see more of these in the future time permitting. Some of the digitisation projects are fascinating and the vacuum board was definitely something I learned today. Very interesting. Do you ever have sessions teaching people how to photograph their own family history or where they can go to get this done or to learn? I have a lot of early Spanish community history. Absolutely fascinating! Especially the image of the “vacuum board”. What a clever innovation. You are all performing such an important and worthwhile job.